Palaces are living legacies left behind by departed kings. They tell us many stories and let us have glimpses of a past when palaces were glorious power centers. Krishnapuram Palace too has its own tales to tell and things to show. Located in the district of Alappuzha in Kerala, near the town of Kayamkulam, Krishnapuram Palace was built in the 18th century by Anizham Thirunal Marthanda Varma, the ruler of the former princely state of Travancore. He built it after Kayamkulam was conquered and made a part of Travancore. The palace is situated near the Sree Krishnaswamy Temple in the village of Krishnapuram and can be accessed via NH 47 between the towns of Ochira and Kayamkulam. It sits atop a small hill, and is surrounded by lawns and ponds and a terraced garden. 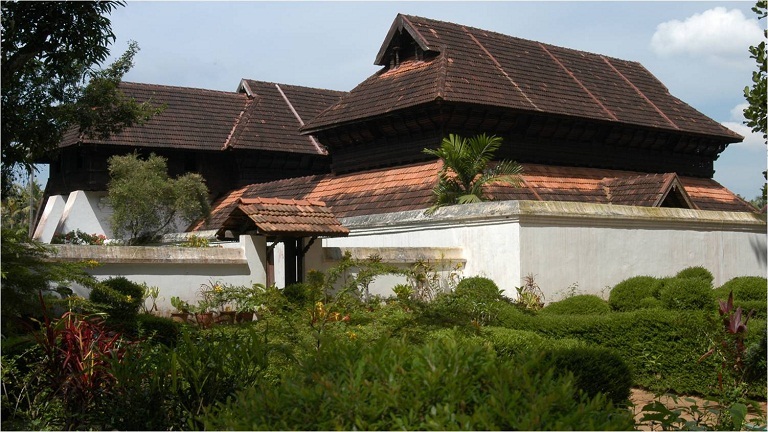 Krishnapuram Palace is built in the conventional architectural style of Kerala with gabled low roofs, narrow corridors, thick-framed doors, and dormer windows. It is built in the Pathinaru-kettu (16 blocks) style, in which rooms are built around four inner courtyards called Nadu-muttams. At the time when the building was occupied by the royal family, it was a large complex consisting of many units. However, most of the smaller units were later lost and now only the main structure has survived. This portion, that was modified and is now looked after by the Kerala State Department of Archaeology, is a three-storey building and houses heirlooms of the royal family and other objects of historical interest. The restored building has retained most of the palace’s original architectural style. A major attraction in the palace interior is the 9.8’ high mural depicting the story of Gajendra-moksham, a famous story from mythology in which Lord Vishnu comes down to the earth to save an elephant who is his ardent devotee. A double-edged sword known as Kayamkulam Vaal, a Sanskrit Bible, bronze statues, an antique Buddha of the 10th century, stone inscriptions, megalithic specimens, Pancha-loha (a combination of five metals) figurines, magnificent oil lamps, and ceremonial utensils are some of the other exhibits here. Krishnapuram Palace is open to visitors on every day except on Mondays.